People will ask what the dog does and I must admit that while having the dog is a game changer for me, you aren’t likely to see her do much more than walk calmly at my side, sleep contentedly under my desk, restaurant table or beside my chair at the theater or concert. For me the dog is a game changer, she is helping me navigate change that must come from within. . .
Read more of mschrysalis’ story. 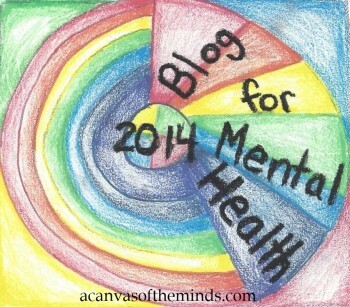 Visit Blog for Mental Health 2015 | Wild Currents. This entry was posted in Wild Currents and tagged Blog For Mental Health 2015, health and wellness, mental health on 2015/03/25 by Ruby Tuesday. Read more of upsidedownchronicles’ story. Visit Why I am In: Blog for Mental Health 2015 | The Upside Down Chronicles. This entry was posted in The Upside Down Chronicles and tagged Blog For Mental Health 2015, health and wellness, mental health on 2015/03/25 by Ruby Tuesday. In addition to this, I also pledge to be there for the bloggers I follow. I will read your posts and try to comment in an appropriate and supportive manner. I will care. And I will also then take you and your situation into Chapel and light a bunch of candles for you. My mental health is currently mostly OK. I’m one of the lucky ones, because my mood is affected by my hormones, and by going on the Pill, that has balanced that out. I know I can’t stay on the Pill for ever, but for now it works. But I have also found that if I start the break for my period when I am in a retreat that is longer than a day, my mood will plummet. I am still a sensitive soul and someone snapping at me can easily upset me at times. However, I am learning how to get perspective and not take things too personally. There seems to be a family history of depression and other mental health issues through my mother’s side of the family. As I said, I’m one of the lucky ones. And I pray that it will continue that way. Read more of Faith’s story. Visit Time to Talk Day | Faith, Hope and Chocolate. This entry was posted in Faith Hope and Chocolate and tagged Blog For Mental Health 2015, health and wellness, mental health on 2015/03/25 by Ruby Tuesday. Being diagnosed with BPD gave me an unexpected sense of relief. I’ve endured a number of diagnoses throughout my many years of mental illness but never felt like they made complete sense compared to what I was feeling. Some of them were incorrect, some were only a piece of the puzzle. But looking into the vast depths and intricacies BPD contains I finally realised that there was a diagnosis that made sense. I finally felt that I wasn’t simply a massive f*ck up, that there was a explanation for why my mind acted the way it does. . . The validation I’ve gotten from connecting with other people online who share my emotions, struggles and experiences with mental illness has brought me great comfort at times. What’s more, hearing from others who blog about their experiences continues to teach me about myself and my mental illness. I find that blogging, venting, and turning to the mental health community helps me to process my thoughts and feelings in a different light. In addition, after years of feeling alone, I have found there is a community of acceptance, genuine care and generosity of spirit formed by others who struggle constantly with their own pain. Read more of Aimee’s story. 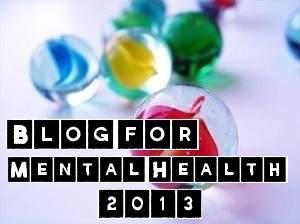 Visit Blog For Mental Heath 2015… And Blogging About My Mental Illness | Borderline Functional. This entry was posted in Borderline Functional and tagged Blog For Mental Health 2015, health and wellness, mental health on 2015/03/25 by Ruby Tuesday. 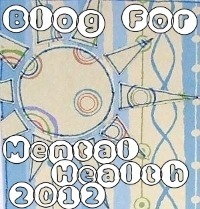 Because it sounds so much like what I do already, participating [in Blog For Mental Health] was an easy decision. I’m used to blogging on my lonesome, in isolation from the rest of the internet, so I look forward to being part of something bigger – allowing others to discover my blog, while discovering the blogs of many others who care deeply about mental health issues. I know I often lose credibility due to my young age – sixteen – but I hope this will not be the case with BFMH. My struggles with my mental health go back to 2006, which was when I lived with what I realized was, in retrospect, an anxiety disorder. Fast forward to 2015 and I’ve been through a number of depressive episodes, which included self-injury and suicide attempts, among many other problems. I also know many people, friends and family members, who have had a wide variety of struggles as well. Read more of UnsilencedHonesty’s story. Visit Blog For Mental Health 2015 | Unsilenced. This entry was posted in Unsilenced and tagged Blog For Mental Health 2015, health and wellness, mental health on 2015/03/25 by Ruby Tuesday. I have struggled with mental illness for nearly half my life. Over time I have fought battles with social anxiety, general anxiety, major depression, ptsd, anorexia, insomnia, seasonal affective disorder, and borderline personality disorder. I am still fighting many of these battles today. I have been in recovery for two years now and counting. Lots of therapy (CBT and DBT), hospitalizations, and medication have helped me greatly, but it was accepting that my weaknesses can be strengths is what helped me choose to turn my life around. I am very interested in what makes us human, and I believe that mental illness is something that does. I believe my mental illnesses are human qualities, but to the extreme. That is why I call my blog A Super-Human Life. We are extra human, super human. And I’m proud of that. Read more of asuperhumanlife’s story. Visit Blog For Mental Health 2015 | a super-human life. This entry was posted in a super-human life and tagged Blog For Mental Health 2015, health and wellness, mental health on 2015/03/25 by Ruby Tuesday. Since the [Major Depressive Disorder] diagnosis, I have ventured in and out of the valley of depression at least 6 times, perhaps more. The thing about depression is – the more episodes you have, the more episodes you will have. All through those years, I asked God to someday use this in my life for His glory. And He has – I’ve facilitated a depression support group at our church, I’ve told my story to the ladies at Women’s Bible Study on several occasions, and I’ve shared one-on-one about the struggle and victories in the battle against this illness. And now I’m blogging about it! So after 7 years, I sometimes walk, sometimes stagger down the road to mental health, with MDD currently in remission. But it never goes away completely. It taunts me when events in my life are a mess. It threatens to take over my thoughts, to remind me of all of its promises – you are helpless, you are worthless, no one understands, stay by yourself, hide under the covers… all the lies that depression whispers in my ear. My goal right now, as depression threatens to re-enter my currently chaotic life, is to recognize it if it comes and practice the techniques I’ve learned to keep it manageable until it passes. I need to remember that it does pass, ’cause it sure feels interminable in the midst of the darkness that surrounds me. I want to lean on Jesus, who has been with me every step of this journey, and on the promises that He will never leave me. I know I’m vulnerable – I’m headed towards another major adjustment in my life – moving across country – and I am trying so hard to not be afraid of what might happen. Read more of Peggy’s story. Visit Blog For Mental Health 2015 Pledge – Gray Clouds, Clear Skies. This entry was posted in Gray Clouds Clear Skies and tagged Blog For Mental Health 2015, health and wellness, mental health on 2015/03/22 by Ruby Tuesday. The view that only a certain kind of person is susceptible to mental health issues is wide spread. In the eyes of the world, the criteria for mental illness are not to do with mood, state-of-mind or self-perception. Mentally ill people are often thought of as lazy, under-achieving, unintelligent, badly dressed, unhygienic, dislikable or violent, but there aren’t any statistics to stand by these speculations. In the four years that I’ve been in contact with mental health professionals, more often than not, I’ve been left frustrated. My GP turned red when he was obliged to ask if I’d been having any more of my ‘Erm… issues’. I was told by a therapist that I self-harmed to get attention because people don’t self-harm due to anxiety. (This still bewilders me…) I was told my depression would alleviate of it’s own accord because I’m ‘a nice girl’. Doctor’s were reticent to recognise there was a problem, despite me meeting all the diagnostic criteria, because I was well-dressed, polite and could hold a conversation. When I was transferred to adult services on turning eighteen I met the regional consultant who asked me to tell him my history. His response to which was: ‘What? Seriously? But, you’re… nice!’ Society has even managed to engrain that mental illness only affects a specific kind of person in people that spend their lives working in mental health care. . .
We all accept that our bodies have their weak spots; maybe a bad back, a sensitive stomach or a dodgy thyroid, but no one wants to accept that they have emotional weak spots too; maybe a tendency to catastrophise, to become paranoid or to lose control of their temper when things go wrong. Just like no one is 100% physically healthy, no one is 100% mentally healthy. If you have a mind, you have the potential to become mentally ill. We all think that we are somehow personally exempt. ‘It’ll never happen to me.’ We’re all wrong, but some of us will discover that the hard way. Read more of N’s story. Visit The Mechanics of a Malfunctioning Mind: Blog for Mental Health 2015. This entry was posted in The Mechanics of a Malfunctioning Mind and tagged Blog For Mental Health 2015, health and wellness, mental health on 2015/03/22 by Ruby Tuesday.